Details: Custom-turned-universal IEM from Japan-based FitEar. Sound (9.5/10) – FitEar’s first mass-produced universal-fit earphone, the TG334 is derived from the company’s MH334 custom-fit model. It is noteworthy not only for being one of the few quad-driver universal earphones, but also as part of the exclusive $1000+ club. The sound signature of the MH334 is an interesting one and is best characterized as mildly off-neutral, with some emphasis on the bass and midrange relative to the top end. My first listen to the TG334 left me slightly stunned – it was the best universal-fit earphone I’d heard, but its sound signature was also quite different from what I had expected. The bass surprised me most of all – so thick and full compared to the vast majority of the other BA-based sets I’ve heard. Unlike many other armature-based sets, the TG334 can move some serious air and bass depth is very good as well. The sub-bass rumble stops just short of bass-heavy dynamic-driver sets such as the JVC FX700. The TG334 still trails the dynamic driver of the AKG K3003 and the custom-fit Spiral Ear 3-way Reference in sheer impact, but only by a small margin. The slightly thick note also means that the TG334 just doesn’t sound as tight and quick as a crisper BA-based set might. In fact, this bass presentation can at times make it difficult to pin the TG334 down as a BA-powered monitor altogether. Compared, for example, to the more level bass of the ATH-CK10, the TG334 sounds noticeably boomy but gains more natural power and depth at the bottom end. Unlike the CK10, the TG334 can produce some serious rumble when necessary – a rarity even among higher-end armature-based monitors. The midrange of the TG334 is clean and prominent, quite possibly the best feature of the earphone’s sound for me. Even though the TG334 is not as entirely neutral to my ears, it manages to maintain top notch transparency. Its midrange is among the clearest I’ve heard, exhibiting no veil whatsoever–clearer, for example, than the mids of the Phonak PFE232 and the custom-fit Spiral Ear 3-way, and more forward and transparent than those of the AKG K3003. Vocals are incredibly intelligible and the mids are very smooth and full-sounding overall. Moving on up, the TG334 remains smooth and refined. The top end is a bit laid-back on the whole, resulting in a slightly darker tone. The AKG K3003, for example, is both brighter in tone and more edgy in treble presentation, even with the ‘reference’ filters in place. Still, despite the soft treble, the TG334 remains pretty neutral – it is not as dark as the Spiral Ear SE 3-way, for instance. There are also no sibilance-accentuating peaks and sets such as the PFE232 and Audio-Technica CK10 sound downright splashy next to the FitEar. Top-end extension is good but doesn’t seem quite as impressive as that of the UE 900 or even the AKG K3003. As a result, the TG334 is not an extremely airy-sounding earphone, but the presentation is great regardless. The ambient presentation is my second favorite aspect of the TG334 after the euphonic midrange. The earphone provides a very good sense of space for a universal – it may not sound as wide as the Sony EX1000, but the headstage has excellent height and depth in addition to good width. Add in great separation and it’s clear why the TG334 images extremely well. Due to the forward mids, it has a slight tendency to stay intimate and in-the-head but the overall versatility is impressive. The soundstaging is noticeably better than that of the PFE232 and the Alclair Reference customs – two very solid mid-tier earphones – and the imaging is at least as good as with any other universal-fit earphone I’ve heard. Perhaps the most reasonably-priced IEM I would dare pit against the TG334, the RE262 is a dynamic-driver design from one of Head-Fi’s favorite manufacturers. Compared to the far more expensive TG334, the RE262 yields in bass extension and power but sounds a bit tighter and quicker. It lacks the dynamics, deep bass presence, and overall impact of the FitEar, and at times can sound downright recessed at the low end in comparison. The midrange of the 334 is slightly clearer, thicker, and fuller compared to the RE262 but the overall tonality is quite similar between the two earphones, with both sounding a little warmer/darker than what I would consider neutral. The treble of the RE262 is a little more laid-back but the overall balance is still good, seemingly benefitting from the lighter bass. Finally, the TG334 wins the soundstaging battle easily with a bigger, more out-of-the-head presentation along with better layering and separation and a more convincing center image. VSonic’s dynamic-driver reference monitor boasts a fantastic price/performance ratio but falls very short of the TG334 in a head to head comparison. While its bass is tighter and more controlled than that of the TG334, the GR07 fails to make up for its lack of midrange and treble performance. The midrange of the GR07 sounds overly lean and distant compared to that of the TG334. Vocals are less intelligible and generally sound less natural and refined. The mids of the TG334, on the hand, sound fuller and simply more “mature” than those of the GR07. Moving up, the GR07 is brighter and has the treble energy that the TG334 lacks. However, in doing so it tends to be significantly more harsh and sibilant. Compared to the soft, yet detailed treble of the TG334, the GR07 seems unrefined and ultimately much less satisfying. The presentation, too, is no match for the FitEar. The layering and soundstage depth of the TG334 make the GR07 sound flat and distant and highlight its lack of a strong center image and the ability to portray intimacy properly. UE’s latest and greatest boasts a similar quad BA configuration to the TG334 but fails to provide the transparency and spaciousness of the pricier FitEar. Compared to the UE900, the TG334 boasts more powerful and dynamic bass and more prominent mids. Its sound is significantly clearer and more transparent, with better detailing and better instrument separation. The UE900 sounds downright veiled in comparison but, on the upside, has slightly better treble presence and extension compared to the TG334. 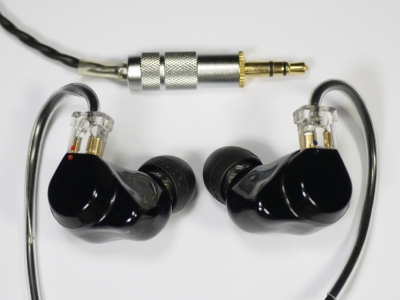 1964EARS’ second-gen triple-BA custom monitor is a mid-level custom earphone, but it does a surprisingly good job of keeping up with the FitEar. The TG334 does have slightly deeper bass and sounds more dynamic and natural than the V3. On tracks with heavy bass presence, overall bass quantity is quite close between the two but the TG334 does a better job of scaling down its bass response when necessary. In comparison, the bass of the V3 can be slightly more boomy and intrusive. Both earphones have clean, upfront mids, but the TG334 doesn’t sound quite as forward as the V3, due in part to its superior layering and separation. Its sound is fuller, as well as slightly more detailed and refined. The V3 boasts more emphasis in the upper midrange and treble for a brighter sound. It can also sound just a touch harsh in comparison but generally remains well-behaved. The presentation battle is won by the TG334 with a more spacious soundstage and better imaging, but by a much smaller margin compared to the RE262 or GR07. The Miracle is a 3-way, 6-driver custom monitor priced slightly below the TG334. To my ears, the Miracle is a hallmark of full-range sound presented in an immersive way. The bass of the Miracle provides the best qualities balanced armatures have to offer, with great extension and a lack of mid-bass emphasis. The result is tight, quick, and very detailed bass that makes the low end of the TG334 sound slightly bloated. It would not be impossible to mistake the TG334, with its greater mid-bass impact and thicker note presentation, for a dynamic-driver earphone when comparing it to the more textured and detailed Miracle. From the midrange upward, it becomes more difficult to split the two earphones except on preference. The TG334 sounds warmer overall, with more emphasis on the bass, mids that are more upfront (especially next to the more laid-back Miracle), and less prominent treble. Resolution is fantastic with both earphones but the brighter Miracle has a slight edge in perceived clarity. The greater sparkle and treble energy of the Miracle contrast the softer, smoother, more relaxed treble presentation of the darker FitEar very nicely without sounding harsh or grainy. The presentation of the Miracle is wider and more spacious compared to the TG334. The TG334 has an impressively out-of-the-head soundstage and very good imaging for a universal-fit earphone but it can’t quite match the sheer size of the Miracle’s presentation. The tighter bass of the Miracle also gives it a leg up when it comes to providing a clean and well-separated sonic image. Value (8/10) – The FitEar To Go! 334 earns its hefty price by joining off-the-charts construction quality with impressive sonic performance. The clean and strong midrange and excellent sense of space combine with soft treble and rich, full-bodied bass to appeal even to those who normally prefer dynamic drivers. The question many will be asking is whether the TG334 performs as well as similarly-priced custom monitors. The answer seems to be “not quite”, but for many the TG334 is likely more practical to obtain than a custom, avoids all of the extra costs and delays associated with impressions and re-fits, and should retain more resale value. There is no question that the 334 is a niche product, but as a universal-fit earphone it is simply sublime. For another perspective, see average_joe’s thoughts on the 334. How is the TG334’s mids compared to the FLC8 with gold nozzle? Even in that configuration the mids of the TG334 are going to be more upfront, and of course more rich and full-bodied, with a warmer tonal character. Compared to the top-range stuff out nowadays, how do you find the 334s to stack up? As an earphone they still hold up, but the value is less impressive – the gap in performance between these and what you can get for half the price has decreased a lot in the past few years..
Yeah, there seems to be a re-emerged focus on IEMs in the past two years, the number of good new models and manufacturers are dizzying at times to keep track of. Have you had a chance to compare the original TG334s with the revised version with the matte faceplate? Unfortunately I haven’t – to date this is my one and only FitEar product. What other universals do you think have been released in the time since the 334’s have come out that are better value, but have similar sound signatures?